Sign up on the links list below. Yay for the Big Book Challenge. 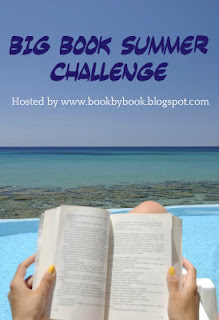 I have got to finish these review books and we're traveling to islands for our June Travel the World in Books Reading Challenge, then maybe I can tackle a big book!! Thanks for sharing with Small Victories Sunday Linkup. Pinned to our linkup board. Sounds like a busy reading summer for you already! I have a couple of book group books to finish before I begin tackling my Big Books too - hope you will join in! How about making the Island Travels a Big Book...? I have to see how long the ones I have are. I really want to pick one of my island books from my bookshelf. I've been horrible about reading my own books this year. Great! will put together a post . Thanks so much for reminding me of this great challenge. I love big books, and I cannot lie. Looking forward to chatting about them with you all summer. ha ha - glad to have you in the challenge again this summer, Jane! Awesome! That is one of my Big Books for this summer, too, Kellee :) Can't wait to get to it - I am just finishing The Raven King & then I still have a couple of book group books before they break for the summer. Once you have your intro post up, remember to come back here to add it to the link-up list! So glad you'll be participating again! Sorry- I added my review post to the kick off post link up! No problem! You can remove it from the kick-off list and add it to the review list - just run your cursor over the entry and click the garbage can icon to delete it. I can't do it but you can always delete your own entries. Glad you will be joining the fun! Oooh...sounds like fun! Thanks for the heads up - I will go check it out! Thanks for the heads up about your BIG BOOK CHALLENGE. I normally do not like challenges, but if it requires only one book and I have a 400 page book, I will participate. Yes, this is a super-easy one, Elizabeth! Just one book of 400 pages or more (though of course, you can read more if you want). All you have to do is write a short kick-off post & link back here, then get started! I have finished "Uncle Tom's Cabin" and have posted my book review on my blog - The Reader and the Book and will have it on Goodreads. Thanks for the challenge...a book I have meant to read for years...496 pages! Late to get you my update but I did manage to finish two books - one on audio and one in print: And The Mountains Echoed by Khalid Hosseini and A Gentlemen In Moscow by Amor Towles. Thanks for the push!